Glass can be softened and fused in the kiln to make decorative and functional objects. As it “melts”, interesting textures can be achieved and other substances encapsulated within the body of the glass, for example metals and organic objects such as leaves or bones. We make sculptural forms by draping over “found” objects such as metal and stone, or casting into custom-made moulds. Many objects can be used in this process, for example shells, man-made objects, fruit and vegetables, hands, feet etc. Any design can be painted, printed or fused into 3D glass objects, such as commemorative awards and souvenirs. Please contact us if you would like more information on these services. The art of traditional stained glass making comes from putting the right colours and types of glass together with well-designed lead-lines. Most domestic stained glass stops at this, but ecclesiastical and some more sophisticated secular Edwardian and Victorian stained glass also include painted glass. Application of specialist glass paints, stains, lustres and vitreous enamels opens up another aesthetic dimension in contemporary architectural glass. The glass is obscured with lines and washes of dark paints that can then be selectively removed to create detail, texture, depth and shading. Enamels and stain can be used to add colour. After each application of paint the piece is fired in the kiln; sometimes a piece may be fired several times. Images of great richness and beauty can be built up in this way. When the glass is fired correctly, painted and stained glass can last for hundreds of years. For large areas of repetitive design or incorporation of photographic imagery into architectural glass, we can use various image-transfer techniques. We screen-print vitreous paints then kiln-fire for longevity, further protection is added by lamination or encapsulation. Digital imagery can also be laminated between glass panes using uv-resistant dyes. Sandblasting is used to create texture on the surface of the glass using stencils or other masking methods. It tends to be used for more formal designs or lettering but can also be used to “carve” glass to give a 3D relief pattern in the surface. In stained glass we also use acid etching to selectively remove colour from flashed glass to give images of more depth and variety, thus avoiding the use of a lead-line. Typically used to create heraldic imagery on a single piece of glass, often with stain to give adjacent areas of yellow through to red. Glass & ceramic tiles, stone, jewels, or found objects such as china fragments can all be used to make wonderful outdoor and indoor artwork. 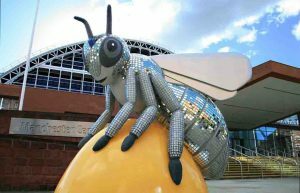 Mirrored mosaics can look spectacular, for example our “Bling Bee” sculpture made for Bee in the City sculpture trail 2018. We make splash-backs from single sheets of decorated or printed glass, back-coated for protection and safety. We can also provide individually-designed tiles to your specification.